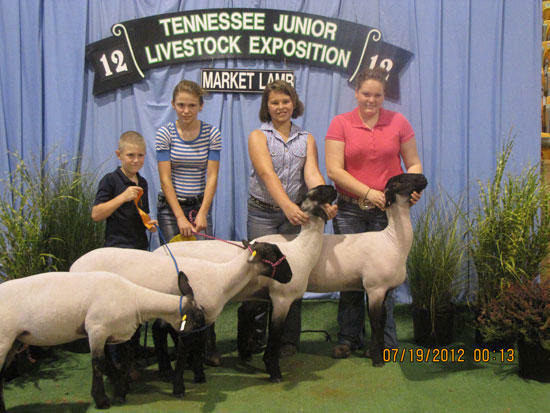 Pictured above (L to R) are: Levi Womack, Faith Womack, Emily Nave, and Hannah Nave with their market lamb entries at the 2012 Tennessee Junior Livestock Exposition Sheep Events held July 17-19 at the Hyder-Burks Pavilion on the campus of Tennessee Tech University. While at the show, these Cannon County youth participated in the showmanship event, where each entry is judged based on how he/she exhibits their entry, skillathon, testing their knowledge of the sheep industry, as well as exhibited their market lambs. Congratulations to each of these exhibitors on their hard work in the 4-H Sheep project.